Vinny Ash gets a plate at Saturday's luau. On one side of a chain-link fence, a line stretches around the block. 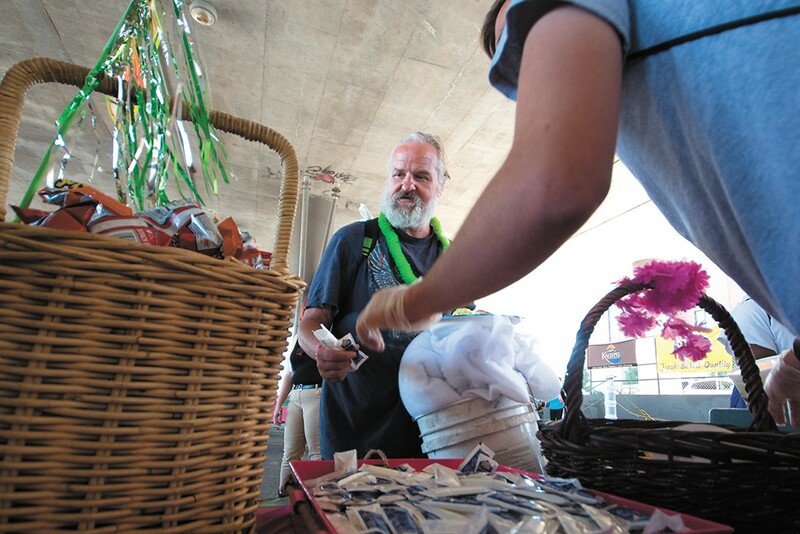 People have been waiting for hours to get into the annual summer luau put on by Blessings Under the Bridge, a nonprofit that provides people in need with meals, pet food, groceries and other services. On the other side, smiling greeters stand, ready to hand each person a plastic lei. Pigs' heads chomping down on apples decorate the first in a line of many platters holding the smorgasbord of meat, fruit, salads and cupcakes. But for many of the guests, the food isn't the main motivation for weathering the late August heat under Interstate 90 in downtown Spokane. Instead, many are here for what's waiting for them after dinner: clean socks and tampons, gently used shoes and clothes, school supplies and backpacks. Every Wednesday, Blessings serves meals to hundreds of people in need in this spot at Fourth and McClellan, but once in summer and once in winter, the organization puts on a massive event that's like a "Wednesday night on steroids," Blessings founder Jessica Kovac tells volunteers just before they open the gates at the Aug. 26 luau. Today there's ice cream from Ben and Jerry's, and the chance to get flu shots from Walgreens, and haircuts, and face painting and storytime. It's all about making people feel loved. But it's not clear how long the organization will be able to keep serving people under the freeway here. The city served Blessings with a 120-day eviction letter on May 12, which means they'll need to find a new spot to serve meals by Sept. 9. Conversations with the city continue to be positive, and there's a chance that Blessings might get a little more time to figure out its next move, but nothing's certain yet. The organization has let the city know it wants to stay put. At the front of the lunch line stands Vinny Ash. At 58, he's been sleeping on the streets for about two years, and carries his belongings with him in a backpack and bucket. He's looking forward to the food, and finding a sweater. "Or maybe a blanket," he says. Around the corner, Heather Fowler has been waiting with her two 17-year-old sons, Michael Williams and Hunter Fowler, and her 4-year-old daughter, Brooklyn Fulkerson. The boys are headed into their senior year of high school, and Brooklyn is just about to start school. They moved here in March from California because the cost of living there was too high. Currently, they're living in a basement they found on Craigslist. "Working minimum wage is not enough, so you find help in any way you can," Heather says. "[This event] means they can go back to school having pencils and papers and things they need." In the line for clothing, Adare Mahan looks for some new shoes for her 3-year-old son Chad. The blond toddler tries on a few hats, arguing with mom when she wants him to take one that isn't 10 sizes too big for his head. Near the entrance, Tara Johnson stands by as her 5-year-old daughter Ava hands out candy to guests as they come inside the fence. They started volunteering with Blessings over the summer after Ava said she wanted to go feed people who were living on the street, Tara says. "I was amazed how much they do every single week," she says. Complaints about the impacts of people living under the freeway throughout the week played a key part in the city's decision to boot Blessings from the site. The property where the nonprofit serves is owned by the state, but rented to Blessings by the city. Spokane officials argue that leasing the space for the weekly event has given the appearance that this space is always open to the public when it's not, making enforcement of city rules against loitering and trespassing difficult. A common thread among neighboring business owners, Lewis and Clark High School officials, and Blessings volunteers is that everyone seems to hate that the discussion has been framed as an "us vs. them" situation in recent months. And most everyone who's been a vocal opponent to the negative impacts of homelessness has also said they support the work that Blessings is doing. But that's usually followed by a "but..."
But... business owners shouldn't have to ask their employees to clean up human feces and urine from the back of their buildings. But... students shouldn't have to walk through a parking lot littered with used condoms and feminine hygiene products. People experiencing homelessness should receive services, but should be encouraged to do so at shelters. Blessings isn't necessarily to blame for issues that occur the rest of the week, but their services do encourage people to hang around. Jim Redmon says he and his wife Laura, and their employees at Divine's Auto Center and Towing on Third Avenue, have noticed a definite increase in problems in the past few years since Blessings started serving in that area. "I think that they're really trying to figure out where the impact is, and of course their feelings are that it's not on them," he says. "Of course there's always been some homelessness and so forth, but we just haven't seen it like it's been in these three or four years." More people are defecating behind their building, and recently they had a crew out to pump an antifreeze canister, but the workers refused to finish the job when they discovered that the bottom of the bin was filled with needles. "I think they've become enabling in a way, and I don't think it's the answer, I really don't, not just because it's the back of our building," Redmon says. "I look at [Union Gospel Mission] and you have to make life choices to get a bed and get fed there." Redmon and his employee Harry Jensen shared their concerns with Spokane City Council on Aug. 14. Jensen told the council that it's not adequate for Blessings to say they can't be held responsible for the actions that happen the rest of the week. "That's kind of like me coming to your house and saying, 'Yeah, I turned on the water, but then I left, so I'm not responsible for the flooding in the basement," Jensen says. "That just doesn't fly." LC Principal Marybeth Smith also shared the school's increasing struggles with the city council. In the past year, a teacher was robbed in the parking lot, a student was assaulted during lunchtime on campus, transient people twice overdosed on campus during the school day, and students were chased and menaced on campus at least three times, Smith told councilmembers. Even with security upgrades, including changes to landscaping, fencing, lighting and policing in the area, Smith says there are still people who are drawn to camp and hang out around the school. Ask any one of the people at a Blessings event if those things are issues, and they'll agree with you, says Kelly Kiki, a high school teacher and coach at North Central High School and a Blessings spokesman. "Every issue that's been brought up — those are real things and real concerns," he says. "No one feels the pressure and struggle of this issue more than [founders] Jessica and Mike [Kovac]. It's been their child for 10 years." The organization has asked the city to consider adding an exemption to its "sit-lie" law to explicitly state that it doesn't apply to people being served at events put on by nonprofits, but is enforceable outside of those hours. Guests have asked whether Blessings will keep serving them, and the answer has been an enthusiastic "Yes, we're not leaving you," says Kiki.